You’re invited to attend the 2019 Denver Marian Conference “Behold Your Mother” on May 10-11, 2019 at the Crowne Plaza Convention Center in Denver. Speakers include Fr. Don Calloway, MIC, Fr. Wade L.J. Menezes, CPM, and Fr. Chad Ripperger. 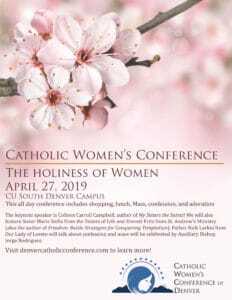 Visit our website for more information and to register: www.DenverMarianConference.com or phone 303-422-8621.